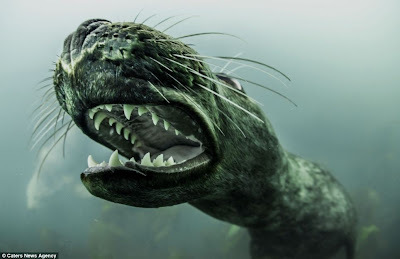 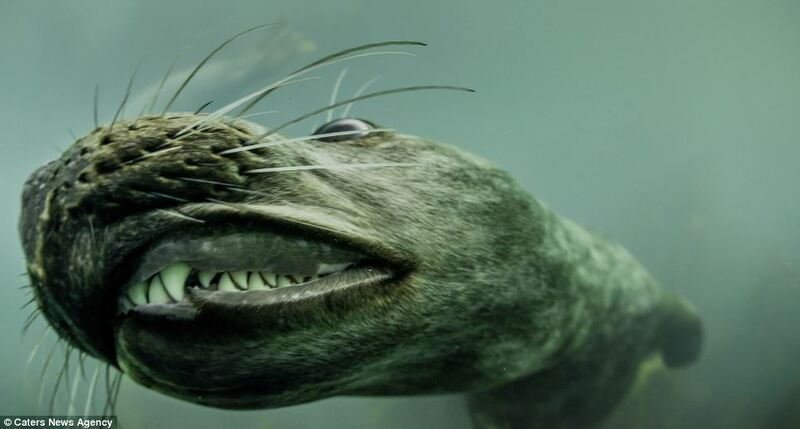 These terrifying teeth should be enough to scare off even the bravest wildlife photographer - but those divers who persevere are rewarded with a unique encounter with an adorable group of playful seals. The stunning set of images of the frolicking marine mammals were captured in British waters by a diver who did well to hang onto his camera when one of the seals attempted to take a bite out it. 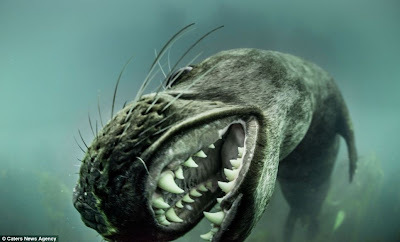 The animal appeared to be growling as he showed off his gnarling gnashers to the camera, but within seconds of this hairy introduction it was having a whale of a time splashing around with the underwater visitor. 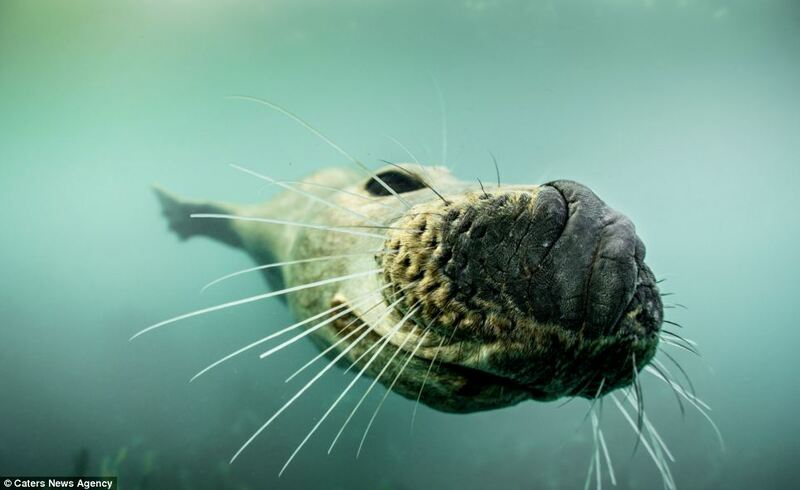 The friendly pair of seals were more than happy to pose for the camera, repeatedly swimming up to the lens, peering into the glass and pawing at photographer Adam Hanlon. 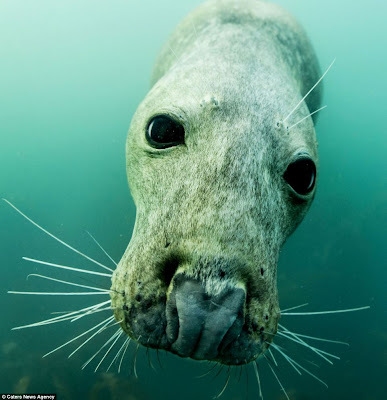 The wonderful pictures were taken in the waters near the Farne Islands, Northumberland, which is a renowned spot for anyone looking to swim side-by-side with seals. Wildlife snapper Adam said: 'The rookery of seals at the Farne Islands is well known as an amazing site for seal interactions. 'There are several thousand seals there, and I've been going to photograph them there for the last 10 years. 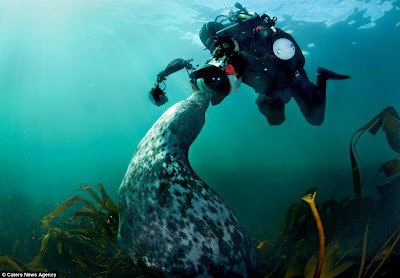 'On the first morning of the dive, as we arrived on our boat, the seals that had been lying on the shore all started to rush into the water. 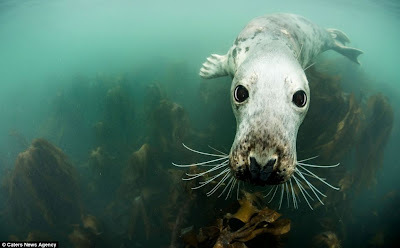 'They then proceeded to swim out and try to splash water onto us in the boat. 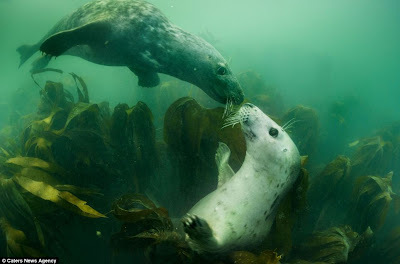 We knew we were on for a good day! 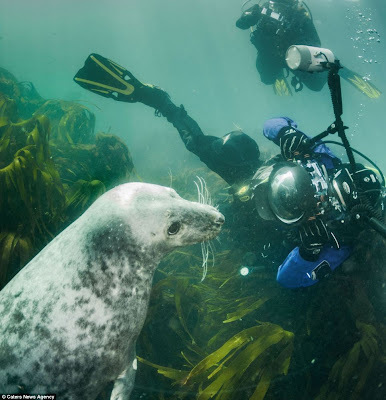 'The Farnes seals are unique in that they have never been fed, or have any other reason to play with humans, yet they choose to come out and play with visiting divers. 'On this particular trip, I spent two days with the seals, which was really magical. They are so friendly.